You are here: Home / Obituaries / Gordon Allen Hawkins Jr.
Gordon Allen Hawkins Jr. 76, of Kamiah, died peacefully April 3, 2019 at St. Mary’s Hospital, in Cottonwood, Idaho. Gordon Jr. was born September 8, 1942 to Gordon Alvy and Virginia Grace Bouldin Hawkins in Douglas, Arizona. His family left Arizona and after a brief period in Oregon they made it to “Pop Bouldins Place” on the North Fork, which is now underwater. Gordon’s father got a job in Kamiah at the hardware store and that is where the Hawkins family made their home. While in school Gordon played baseball, was a life guard, and really enjoyed being in the band. After graduating from Kamiah High School in 1961 he then purchased the Texaco Station in Kamiah. On his 21 birthday he meet Sherlee Luann Eller at the Orofino Drive Inn and asked her to go on a date. They had their first date at the Drive-In. Four months later on another date at the drive-in, he asked her to marry him. They found a small duplex in Kamiah to start their adventures and ended up buying the house right next door where they have resided since. Gordon and Sherlee loved Kamiah and were very active in the community. He was a member of the Jaycees, helping to build the Kamiah Clinic. Gordon formed the Kamiah Ambulance 47 years ago, was the Kamiah Assistant Fire Chief for more than 40 years, served as the Lewis County Coroner for 25 years, was a Charter Member of the Camp Creek Bunch. Over the years he received many various awards; eventually receiving the Outstanding Community Service Award in 2016. Gordon worked at several places over the years including the Texaco Station, Hanson’s Garage, Bill Lanes Auto Parts, Olives Auto Parts, and Napa. 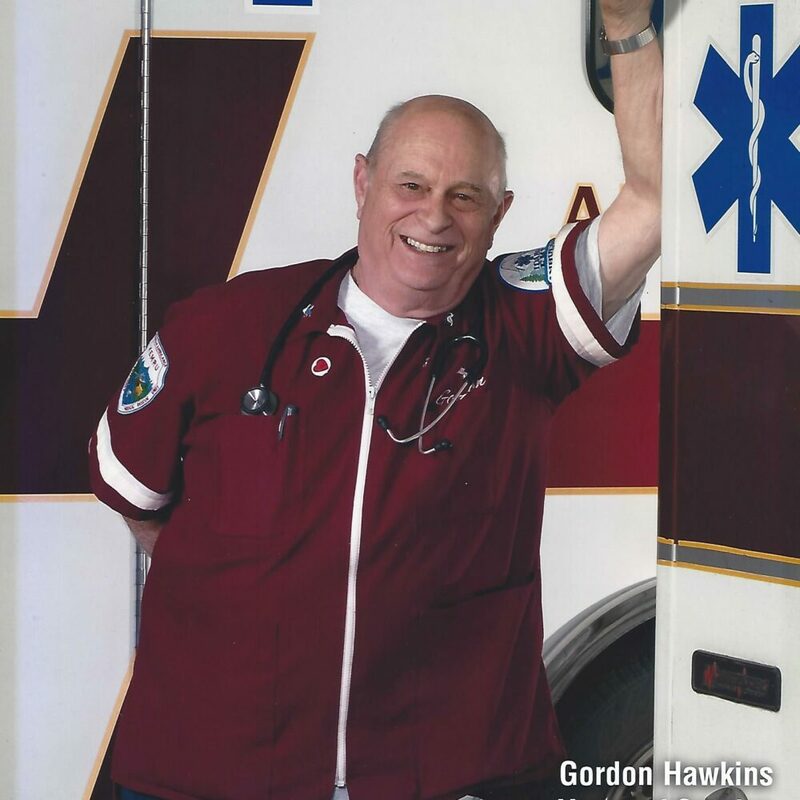 When Gordon wasn’t on an Ambulance run, saving lives, delivering several babies, helping with community events he loved to camp, hunt, and most of all to be with family and friends. Gordon was loved and will be missed by his family, friends, community, and the many people he helped over the years. He is survived by his wife of 54 years Sherlee Hawkins of Kamiah, his son Russell (Robin) Hawkins of Nampa, a daughter Kelly Wasson of Kamiah, grandchildren Nicholas (fiancé Erica Johnson) Wasson of Lewiston, Markey Wasson of Kamiah, Catherine (Troy) Woods of Boise, Kellie (Jeremiah) Mathot, and Johnathon Gillespie; great-grandson Levi Mathot, son-in-law Mark Wasson, kids Ted (Tiffany) Weeks of Kamiah, and grandkids Teresa “Pickle” Weeks, Tyson (Nicole) Weeks and Mitch (Samantha) Holman, brother Ed Hawkins of Kamiah, sister Janet McCabe, the twins Ken and Kathy Hawkins of Portland, a niece Jessica (Marcus) Mathison, and great nephew Oliver Mathison. A Memorial Service will be at 11:00 am Saturday, April 13, 2019 at St. Catherine’s Catholic Church (Idaho Street) in Kamiah. A potluck dinner will follow in the basement. Condolences may be left at www.trenaryfuneralhome.com In lieu of flowers contributions can be sent to the Kamiah Ambulance Fund In memory of Gordon at Freedom Northwest Credit Union.